©This paper is not for reproduction without permission of the author. The law of temporal hierarchies of the biological world allows us to pick out of the biomass quasi-closed thermodynamic systems of a specific hierarchy. The use of this law of Nature as applied to supramolecular structures of organisms allows us the opportunity of using the methods of equilibrium supramolecular thermodynamics in the examination of open living systems. It has been proven that the second law of thermodynamics in its classic formulation is easy to apply to specific aspects of living systems in order to make calculations, carried out through methods of chemical, supramolecular and overall hierarchical thermodynamics. Keywords: Second law of thermodynamics, Law of temporal hierarchies, Supramolecular thermodynamics, Origin of life, Biological evolution, Aging. This article explores several aspects of a thermodynamic (thermostatic) model of biological evolution and aging of living organisms. Work in this sphere was begun in 1975 (Gladyshev 1978). Since then many experimental results have confirmed the author’s theory. The current article is not a survey of achievements in the sphere of biological evolutionary theory and the development of biological systems. The author refers only to research that has a direct bearing on his model. References to works that discuss other models of evolution and development of the bio-world (from the position of synergetics, information theory, kinetics, non-equilibrium thermodynamics and so on) may be found in other research, for example, in D.R.Brooks, 2001. “Mathematics is the language of science.” This well-known phrase is tied to G. W. Gibbs, creator of an extremely precise physical theory. Indeed, in every age, researchers have tried to describe natural phenomena in the language of mathematics and to quantitatively characterize the observed factual relations. Models are created in order to describe that which is observed but models themselves operate according to a defined and specific correspondence to reality, in given scales of time, energy, space and chosen structural hierarchies. Therefore, it is not by mere chance that, in science, nuclear transformations, chemical and supramolecular interactions, biological, social and other phenomena are considered within separate models. The division of science into separate disciplines is amended by the unifying role of mathematics as a universal language of science. The use of idealized linear models enables general comprehension of the physical essence of phenomena. When one fails to create linear models, non-linear models are required. If we cannot isolate a specific hierarchy of structures, scale of time, scale of energy and scale of space, we can only investigate a system as a complicated non-linear system. From this point of view, any observed complex "mixed" phenomena requires a non-linear description. Hence, when a researcher does not intend to or is unable to create linear models, he uses non-linear models, which, because they are not generally amenable to precise descriptions, distance us from the physical, chemical or biological details of these phenomena. Despite the non-linearity of our world, this problem was well understood by the classicists of natural science who therefore, in the first instance, tried to depend upon linear models. In using non-linear models, we can approach the sphere of mathematical modeling if we move to the area of synergetics. It should be noted that synergetics is often defined as a branch of science, which studies the relationship facts of origin and the development of temporal and (or) spatial structures. However, the said structures and their transformations can be conceived and described from the position of either linear or non-linear models. We can use linear models for instance, to talk about thermodynamic self-organization (Gladyshev), the self-assembly of various hierarchical structures or about dynamic self-organization or simply self-organization in Prigogine's terminology. From the point of view of thermodynamics (thermostatics), thermodynamic self-organization is investigated via functions of state, i.e., functions with full differentials. Dynamic self-organization is characterized by kinetic functions and cannot be described in terms of classic (equilibrium) thermodynamics. If we compare linear models of classical science with non-linear synergetical models, the following is evident. Linear models make it possible to establish details of any phenomena, for example to "reveal" their physics and easily quantitatively "coordinate" these phenomena with the general laws of nature. As stated above, non-linear models, as a rule, distance us from the details of the phenomena and push us into a type of mathematical modeling which may be inefficient from the point of view of understanding phenomena in terms of general laws of nature. However, in many cases, such an approach allows to resolve important problems. Science makes use of different approaches and models. This allows us to recognize the world around us. So, it would hardly be reasonable, as has become fashionable, to declare that synergetics is the "cutting-edge of science" and to disregard the classic approaches. Classical scientific methods have reached high summits and shown themselves to their advantage over the ages. Modern synergetics, whilst undoubtedly an attractive and important area of research, has to "cleanse itself" of the elements of "superficial" mathematical modeling and reveal new, truly rational, constructive models of world recognition. The best criterion of quality of any theoretical model is the strength of its foresight and the possibility it provides for appraisal of observed and predictable characteristics in the language of computation, i.e., that of figures. The second half of the 20th Century has been characterized by a series of misunderstandings in the field of the natural sciences. Many researchers, following fashionable tendencies, claimed that it was impossible, in principle, to apply the methods of classical thermodynamics (thermostatics) to the researchof open systems and, above all, to biological systems. Moreover, on the basis of this conviction, conclusions were reached regarding the impossibility of applying the second law of thermodynamics in its classic formulation to the explanation of the origin and evolution of life (Prigogine 1980; Gladyshev 1997; Shu-Kun Lin 1999a). This perspective facilitated the development of approaches using mathematical models, which, however, had nothing in common with the physical essence of the phenomenon of life. A lot of work appeared which resulted in confusion in the use of terms as, for example, the term of entropy. For instance, the classic entropy of Clausius-Gibbs, is often identified with the informational entropy of Shannon, . All this led to many articles in scientific journals containing unwieldy mathematical expressions and, in principle, complicated unverifiable experimental formulae. If one took a step back and looked at this unfolding situation, one could come to the conclusion that science had changed into its own particular version of a “strange attractor”. However, luckily, this was not so! The number of researchers who understand the mistakes inherent in the above-mentioned fashionable tendencies within the natural sciences is growing. So, the editor-in-chief of the new scientific journal Entropy, Dr. Shu-Kun Lin writes in an editorial that “it is no surprise that an honest chemist (among other educated chemists, biologists, etc.) will tell you that he has never found an application of this entropy theory in chemistry (or in biology, physics, engineering.” (Lin 1999b:1). The author has in mind “Prigogine’s dissipative structure theory.” He also comments: “I have a clear opinion regarding this entropy theory. Its main problem is that it does not conform with the Second law of Thermodynamics”. To differing degrees, this point of view is shared by many researchers, for example, the author of the present publication (1997) and Dr. K. Denbigh (Denbigh 1989). It is important to note that, in the general case of Prigogine’s entropy, it is a kinetic function insofar as its differential is not total. In any case, this entropy does not identify with the entropy of Clausius and Gibbs (Gladyshev 1997; Denbigh 1989). Let us ask a naive question. Is the chromatographic column an open system in itself? The answer is clear; it stands to reason that this is an open system! If the sorbent in the column has certain catalytic activity qualities, then such a column may sustain chemical reactions between components of the solution (gas) entering the column. 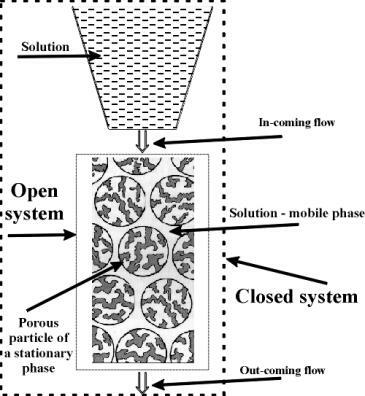 It is also possible that there will be chemical interaction between the components of the mobile and stationary phases. In this way, such a column may sustain chemical reactions, which also have their place in living organisms (Figure 2). Any educated biologist, chemist or physicist will be well aware that processes occurring in effective chromatographic columns are with a good approximation, in a state of thermodynamic equilibrium. In other words, such chromatographic columns are quasi-equilibrium steady state systems. Figure 1: Liquid chromatography column in which chemical reactions do not occur. In the column steady state is established. It is possible to regard an organism’s tissues as systems containing a multitude of micro-chromatographic columns. Moreover, the nature of both the stationary and mobile phases of these columns differs substantially. At the same time, the functional effectiveness of such natural micro-columns must be extraordinarily high. where – coefficient which changes evenly during the evolution of the composition in the stationary phase, for example, the biosystem (in principle, each micro-volume is characterized by its coefficient ), – gas constant, - absolute temperature, - the specific (averaged by volume or mass) Gibbs function (the Gibbs free energy) of formation of supramolecular (intermolecular) structures, appearing as a result of interaction between particles found in the mobile and stationary phases. The sign "-" means that the specific value is considered and the sign "~" points out the heterogeneous nature of the system. If substances with a high affinity to the sorbent are injected into the column or are synthesized in the column continuously, then they will accumulate in the column. Such a column, according to its components, the concentration of which increases in the column, may be regarded as partially kinetic quasi-closed. This column, as a living system, is enlarged and its volume and mass are increased (Figure 2). If the substances accumulating in the column are capable of reproducing themselves, then their concentration in the system will grow rapidly, a process that will noticeably change the chemical and supramolecular compositions of the substances playing a role in the stationary phase. It is also possible to use chromatographic methods to separate organelles, cells and other bio-structures. The chromatographic systems studied by chemists are analogues of living systems (Figures 1 and 2). The application of classical thermodynamic methods in order to investigate dynamic systems under consideration is entirely correct, independent of whether they are stationary, quasi-stationary or non- stationary! Moreover, it is obvious that the equilibrium separation of substances in the column does not depend on the degree of non-equilibrium of the chemical transformations in the column, if applicable (Gladyshev 1999a,b; Porter 1983; Tanford 1978). Figure 2: Living chromatographic column in which biochemical reactions occur. There is the steady state in the column. At times, which are much more than the average lifetimes of cells, the column is a non-stationary system. The column is enlargedand its mass and volume are increased. A small arrow means that a system is enlarged. As far as studying the dynamics (kinetics) of changes in a substance’s nature in the biological “columns” is concerned, it is advisable to investigate the changes during ontogenesis, phylogenesis or evolution of supramolecular structures. It is understood that such an approach gives no information regarding the mechanism of the process. However, it does give information regarding the extent (degree of advancement) of the processes, for example, such as that of tissue aging in living organisms. However, one must not forget, when investigating open systems, that the rational application of the methods of equilibrium thermodynamics requires certain limiting conditions. One of these fundamental conditions is connected with the constancy (invariability) of the concentration of components of the solution or gas entering the column as an open system. This condition, as is obvious from the standpoint of the thermodynamic theory of evolution and aging of living beings, requires the provision of a thermostat (in the wider sense of this term, as used in physics) for the open system (Gladyshev 1995, 1997; Sychev 1986). In fact, this thermostat is the environment that surrounds this very system. The thermostat is characterized by constancy (invariability) in all thermodynamic parameters. These parameters are temperature, pressure, intensity of physical fields, concentration of chemical substances, etc. We note that in the thermostats of living systems, these parameters, although they vary in adaptive zones, retain more or less constant values for comparatively long periods of time (Gladyshev 1997, 1999a). This is a consequence of the general law of nature – the law of temporal hierarchies in the biological world (Gladyshev 1978, 1995, section 5 below). Let us also direct the attention of the reader to the fact that with respect to the chromatographic separation of substances, even chemical laboratory conditions can support the values of temperature, pressure and other parameters relating to the environment surrounding the column with limited precision. It is understood that this precision corresponds in part to the lesser variations with respect to different parameters of the thermostat than is the case with many real biological systems, which exist for any length of time. All the same, in all such cases, we are dealing with one or another open system model - models that are studied using the methods of equilibrium thermodynamics (Figures 1 and 2). Why is it that so many researchers paid no attention to existing, constructive, scientifically based approaches toward understanding the origin of life and evolution of living beings from the standpoint of physical chemistry and, in particular, supramolecular thermodynamics? This is a complex question. In my view, above all, the answer is dependent upon the circumstance that science has become a mass phenomenon and many researchers, orienting themselves towards the “declared fashion”, hope to achieve a “fast” result. Additionally, it may be suggested that the majority of physical chemists do not wish to dissect the mistakes of others and prefer to carry out their own experiments, guided by classical scientific foundations. It is generally understood that living systems consist of molecules, particles capable of independent existence, formed from two or more atoms. Atoms in molecules interact by means of chemical bonds, the energy of which varies within broad limits. For example, within the nitrogen molecule, the energy of the bond between atoms approaches approximately 1000 kJ/mole, whereas the bond between atoms of carbon in different biopolymers and biomolecules would generally vary between 150-300 kJ/mole. In the conditions in which living organisms exist, these bonds are quite stable insofar as their energy (energy essential for their decomposition) is high in comparison with the energy of molecule movement, characterized by the value , where – Boltzmann's constant, – absolute temperature. An organism, consisting of different organs and tissues, is a “complex living polycrystal”, formed from a diversity of molecules. Molecules unite in supramolecular formations, examples of which are the double helixes of DNA, the structures of proteids, and also chromatin and others. Intermolecular interaction between separate atoms belonging to different molecules is comparatively weak. As a rule, the energy of their interaction does not exceed around 20 kJ/mole, although in individual cases, it does reach a magnitude in the order of 40 kJ/mole. Such bonds within biological systems, which always contain water, may be relatively easily decomposed as a result of changes in a number of parameters of the system, such as temperature, environmental PH, ionic strength of the solution, and also upon changes in the composition of the surrounding environment. Thus, in tissues and bio-structures of living beings (as in many inanimate systems), chemical and intermolecular connections differ substantially. This allows the independent study of processes not only connected with the decomposition and appearance of new chemical bonds in systems, but also of the processes of transformation of supramolecular structures, formed by intermolecular interactions. The first type of transformation should be ascribed to chemical processes, and the second to supramolecular processes. Therefore, it is essential to differentiate between the change (the variation) in functions of states of systems, connected with both chemical and supramolecular transformations. Such a division of functions of states of systems in respect to the components is generally accepted and agrees with our experience in the natural sciences. It permits the study of the thermodynamic behavior of supramolecular structures independent of chemical transformations within the system. A look at the world around us shows that the average lifetimes (life-spans) of bio-molecules, supramolecular structures, cells in tissues, organisms, populations, form a number of strong inequalities. Thus, the lifetimes of molecules of amino acids in tissues (from the moment they appear in the cell up to the time of their participation in chemical transformations) are substantially shorter than the lifetimes of protein macromolecules in cells. In turn, the macromolecules exist in the bio-tissue cells for a short time in comparison with the lifetimes of the cells themselves. The cells, as a rule, live for a significantly shorter period than the lifetime of the organism, and the lifetime of the organism is a lot shorter than the lifetime of the populations they create. is a general law of nature. Here t – average lifetime of “free” molecules-metabolites (m), supramolecular structures (im), organells (organell), cells in the tissue (cel); organisms (org); populations (pop); societies (soc). It is easily shown that the existence of series (1) allows us to pick out the summation of structures of one hierarchy as a subsystem and to consider this subsystem as a quasi-closed system. It is understood that in order to study such a system, it is possible to use the methods of equilibrium hierarchical thermodynamics (Gladyshev 1997). For example, insofar as cells (or their parts) live for a far shorter time than organisms, one may consider that the organisms’ (organ’s) medium practically does not change during the lifetime of the cells. This medium fulfills the role of a thermostat for the quasi-closed subsystem (system) of the organism – cells. It is necessary to bear in mind that each species of living being (tissue, types of cell, types of organelle, etc.) is characterized by its lifetime values of the elements of the different hierarchical structures. However, for all lower level hierarchies of living systems, which are parts of a higher-level hierarchy (population, organism, organ, cell, supramolecular formation, and so on), series (1) is fulfilled. where - average lifetime of structures of lower hierarchical level, - average lifetime of structures of higher hierarchical level. The existence of low (1-2) allows us to use quasi-closed thermodynamic models to investigate living systems. where and are the mean duration of the existence of the corresponding structural hierarchies in a living system, x = 0, 1, 2, …, etc. Here, tm (tch) is the average life span of an organism’s molecules (chemical compounds) that take part in metabolism. ( ) is the average life span of any supramolecular structures of an organism’s tissues that are renewed in the process of its growth and development. is the average life span of an organism in a population. And is the population’s average life span. The series of strong inequalities (4) does not include the life span (lifetime) of cells (cell) and some other supramolecular structures. However, this series of course tallies well with reality and reflects the existence of temporal hierarchies in the living systems. 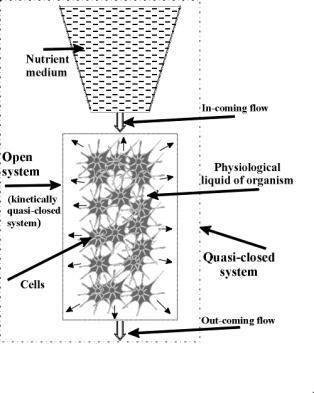 The latter rigidly substantiates the possibility of identifying quasi-closed systems (subsystems) in open biological systems. The thermodynamic theory of biological evolution and the aging of living beings accords with numerous facts and with mankind’s empirical experience (Gladyshev, 1988, 1996, 2002i, 2002j). Under the influence of solar energy, substances that were thermodynamically stable under the conditions of a young Earth were transformed (as, indeed, they are transformed today) into various products of photosynthesis (Porter 1983). Then, as a result of spontaneous "dark reactions” in accordance with the laws of chemical thermodynamics, these products are transformed into different substances. The selection of the indicated substances is “made” by kinetics in accordance with these very laws. According to the laws of local supramolecular (im) thermodynamics of quasi-closed systems, from the whole spectrum of chemical substances (thanks to the tendency of the supramolecular components of Gibbs function, of biostructures towards the minimum) the more stable superstructures, which accumulate in micro- and macro-volumes of systems, are selected (Gladyshev 1978, 1999a, 1999b). Individual macromolecules and superstructures become reduplicated, due to the nature of matrix mechanisms.The first to be selected are nucleic acids, the composition and structure of which (due to the action of thermodynamic factors) slowly adapt themselves to the nature of the surrounding, including that of proteins, whose composition is determined by DNA itself. This explains the existence of feedback between the structure of proteins and DNA. In accordance with our model, such feedback has its basis in thermodynamics. Running parallel to the processes of synthesis, processes of degradation occur, related to the decay of chemical compounds. However, living systems oppose this and try to maintain their state. This tendency also has a thermodynamic character. Biosystems reproduce dying supramolecular structures. Additionally, as has already been noted, thermodynamics facilitates the selection of the more stable ones among them. It is thermodynamically advantageous for macromolecular chains to tie up with chains similar to themselves and surround themselves (at the expense of supramolecular contacts) with renewed “young” substances of living organisms. Evolution selects those thermodynamically preferable paths of processes, which facilitate cell division and preservation of DNA. All this occurs with a background of variations in the parameters of the thermostats (the surrounding environment), which (on a par with other factors) ensures that life is supported. Thermodynamic factors facilitate the stabilization of all complex biological structures, resulting in the appearance of the higher hierarchies of the bio-world. In accordance with the thermodynamic theory of biological evolution and aging of organisms, the specific value of the Gibbs (or Helmholtz) function, in respect to the formation of supramolecular structures of tissues, tends to the minimum. Although the “action” of the principle of structural stabilization slows down this tendency (Gladyshev 1997, 1999a, 1999b), the death, nevertheless, of the particular biosystem is inevitable. The question lies only in how long this system will have existed. The aging processes of the tissues of a living organism from the standpoint of the transformation of their supramolecular structure in localized zones occurs in conditions close to equilibrium as, for example, in the case of slightly non-equilibrium phase transitions of the first order of any substance. Moreover, it makes no difference how far from equilibrium the processes of chemical transformation in the organism may be. The supramolecular evolution of an organism’s structure “directed by thermodynamic force”, only uses a chemical substance to build supramolecular structures in the organism’s tissues (Tanford 1978). The concept of the gerontological value (or anti-aging value) of products with a biological origin from the viewpoint of supramolecular thermodynamics was first introduced into the scientific field in the 1990s. The gerontological valueof food, cosmetic, or other natural product or substance is the quality of the product (substance), expressed in GPG units (the value of where - the Gibbs function of formation of supramolecular structure of the tested bio-tissues, - the Gibbs function of formation of supramolecular structure of the standard), characterizing its ability to support the youthfulness and healthiness of the organism, to rejuvenate its tissues, and positively influence the duration and quality of life. It is advisable to use the GPG indicator to evaluate the comparative gerontological qualities (values) of a concrete foodstuff, a foodstuff from a given class of foodstuff (oils, fats, animal and fish flesh) or from different classes of foodstuff (the bio-mass of any marine or vegetable substance) and so on. It is convenient to use the GPG indicator 10-point or 30-point scale. The higher the indicator, the higher the gerontological value of the product. For example, wheat shoots have a GPG indicator close to 9 points, whilst an aging biomass of wheat stalk scores around 1 point. Longevity and the preservation of health and youth are assisted by the utilization of foodstuffs in ones diet, which have a high GPG indication. Moreover, elasticity of the skin, sexual potency, muscle strength, and other characteristics determining the quality of the organisms vital functions are substantially improved. Thermodynamics does not examine the mechanisms of processes and phenomena – in this lies its weakness. The strength of thermodynamic theory lies in the fact that it permits the possibility of studying the extent of transformation of structures in the systems themselves (their composition) during the process of evolution. When determining the direction of evolution of biosystems on a chemical and supramolecular level, the “surprisingly incomprehensible” complexity of structure of chromatin, organelles, cells, and any other biological objects has no significance. The model presented in our work supports the action of the laws of thermodynamics in each local volume of supramolecular structures and, in the final analysis, in any (according to size) macro-volume biological mass. The calculations performed are found to fully correspond with the theory and all facts known to the author (Gladyshev 1978, 1995, 1997, 1998, 1999a-h, 2002i-j; Lepock 1998; Hancock 1990; Talhout, Engberts 2001; Arrhenius and Mojzsis 1996; Cantor and Schimmel 1997; Ivanova 1999; Wolffe 1999; Rafikov, Budtov and Monakov 1978). General methods are essential in order to learn about the world. One of these, I suggest, ought to be the method of macrothermodynamics (the hierarchical thermodynamics of heterogeneous systems), applied to all hierarchical levels of living matter. The law of temporal hierarchies of the biological world allows us to pick out of the biomass, quasi-closed thermodynamic systems with a given hierarchy. The use of this law of Nature as applied to supramolecular structures of organisms gives us the opportunity to use the methods of equilibrium supramolecular thermodynamics in the examination of open living systems. It has been shown that supramolecular thermodynamics is one of the “keys”, which allows us to explain the origin of life and evolution of living beings. The Second law of thermodynamics in its classic formulation is easy to apply in order to make calculations, carried out through methods of chemical, supramolecular and overall hierarchical thermodynamics. The author of the paper proposes that the thermodynamic theory of evolution and aging of organisms within the framework of application of the basic understanding of thermodynamics will never be refuted. It can only be perfected and made more precise. I am very grateful to Prof. Dr. Edwina Taborsky for English language corrections. Cantor, Ch. R. and Schimmel, P. R. 1997. Biophysical Chemistry. San Francisco: W.H. Freeman. In Russian,.Vol. 3: 534. Denbigh, K. 1989. Note on Entropy, Disorder and Disorganization. Brit. J. Phil. Science. 40: 323-332. Gladyshev, G. P. 1978. On the Thermodynamics of Biological Evolution.. J. Theoret. Biol.75: 425-441. —. 1995. Thermodynamics of Hierarchical Systems. In: Khimicheskaya Enciklopedia (Chemical Encyclopedia); Bolshaya Rossiiskaya Enciklopediya: Moscow. Vol. 4: 1063-1065. —. 1997. Thermodynamic Theory of the Evolution of Living Beings; New York: Nova Sci. Publ. Inc.
—. 1998. Thermodynamics of Aging. Biology Bulletin 25: 533-543. —. 1999a. On Thermodynamics, Entropy and Evolution of Biological Systems: What Is Life from a Physical Chemist’s Viewpoint. Entropy 1: 9-20. www.mdpi.org/entropy . —. 1999b. Thermodynamic Theory of Biological Evolution and Aging. Experimental Confirmation for Theory. Entropy 1: 55-68. www.mdpi.org/entropy . —. 1999c. Thermodynamics of Aging. In: The 1999 Pan-American Congress on Gerontology and Geriatrics. San Antonio: Cortex Communications. Abstract P49: 40. —. 1999d. Supramolecular thermodynamics. In: Frontiers in Chemistry: Molecular Basis of the Life Sciences. 37th IUPAC Congress. 27th GDCh General Meeting, Berlin, Germany. Book of abstracts, part 2, GDCh, Frankfurt am Main: 873. —. 1999f. Thermodynamics of Aging. In: 1999 International Symposium on Aging and Antiaging Science & Technology Beijing, China. Book of abstracts, China International Conference Center for Science and Technology: 26. —. 1999g. In: Fractals and Applied Synergetics.Russian Academy of Sciences, Moscow: 11-12. —. 1999h. Supramolecular Thermodynamics of Genes and Aging. Adv. Gerontology 3: 65-67. —. 2002i .On the Principle of Substance Stability and Thermodynamic Feedback in Hierarchic Systems of Bioworld. Biology Bulletin, 29, 1: 1-4. Gladyshev G.P. and Kurnakova N.V. 1998. Motive Force of Evolution of Living Matter and Thermodynamic Theory of Aging, Adv. Geront. 2: 49-58. Hancock, W. (Ed.). 1990. High Performance Liquid Chromatography. In: Biotechnology. New York: Wiley. Ivanova, V. 1999. Synergetics. Strength and Fracture of Metallic Materials; Cambridge Inter. Sci. Publ: Cambridge UP. Lepock, J. 1998. In: 1998 AAAS Annual Meeting and Science Innovation Exhibition. C.J. Boyd, S. Michael, P.D. Strauss, Eds., American Association for the Advancement of Science, Philadelphia. A-30, S-26. Lin, S-K. 1999a. Book Review: Modern Thermodynamics: From Heat Engines to Dissipative Structures. By Dilip Kondepudi (Wake Forest University) and Ilya Prigogine (University of Texas at Austin). Wiley: Chichester, UK. 1998. Entropy, 1, 101, www.mdpi.org/entropy . Lin, S-K. 1999b. Diversity and Entropy. Entropy, 1,1-3, www.mdpi.org/entropy. Porter, G. 1983. Transfer and Storage of Chemical Radiation Potential. J. Chem. Society, Faraday Trans. 2, 79, 473. Prigogine, I. 1980. From Being to Becoming: Time and Complexity in the Physical Sciences; San Francisco: W.H.Freeman. Russian translation, Nauka: M., 1985. Rafikov S. R.; Budtov V. P. and Yu. B. Monakov.1978. Introduction to Physico-chemistry of the Polymer's Solutions; Nauka: Moscow. Sychev, V. 1985. Thermodynamics of Complex Systems; Energoatomizdat: Moscow, 1986, p. 208. English translation. Moscow: Mir. Talhout, R.; Engberts, J. 2001. Thermodynamic analysis of binding of p-substituted benzamidines to trypsin. Eur. J. Biochem. 268: 1554-1560. Tanford, Ch. 1978. The Hydrophobic Effect and the Organization of Living Matter. Science 200: 1012-1015.